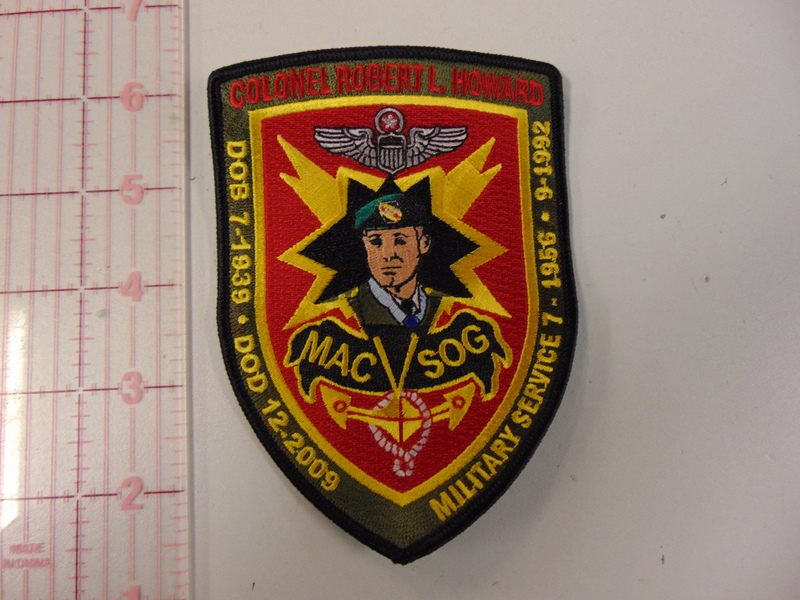 We made a patch in honor for an American Hero Robert L. Howard. Robert Lewis Howard (July 11, 1939 – December 23, 2009) was a highly decorated United States Army soldier and Medal of Honor recipient of the Vietnam War. He was wounded 14 times over 54 months of combat, was awarded 8 Purple Hearts, 4 Bronze Stars, and was nominated for the Medal of Honor three separate times. He was laid to rest at Arlington National Cemetery on February 22, 2010. Howard enlisted in the Army at Montgomery, Alabama and retired as Colonel. As a staff sergeant of the highly-classified Military Assistance Command, Vietnam – Studies and Observations Group (MACV-SOG), Howard was recommended for the Medal of Honor on three separate occasions for three individual actions during thirteen months spanning 1967–1968. The first two nominations were downgraded to a Silver Star and the Distinguished Service Cross due to the covert nature of the operations in which Howard participated. As a Sergeant First Class of the same organization, he risked his life during a rescue mission in Cambodia on December 30, 1968, while second in command of a platoon-sized Hornet Force that was searching for missing American soldier Robert Scherdin, and was finally awarded the Medal of Honor. He learned of the award over a two-way radio while under enemy fire, immediately after being wounded, resulting in one of his eight Purple Hearts. Howard was wounded 14 times during one 54-month period during the Vietnam War. He received two Masters degrees during his government career which spanned almost 50 years. Howard retired as a full Colonel in 1992. His Army career spanned 1956 to 1992. Howard is the most highly-decorated American soldier since World War II. His residence was in Texas and he spent much of his free time working with veterans until the time of his death. He also took periodic trips to Iraq to visit active duty troops.